"Tarot is Trending and Dior Predicted This Months Ago"
Motherpeace Tarot was developed in the late 1970s in Berkeley, California. Round, feminist, and featuring people of color at a time when standard tarot decks depicted white men in medieval costumes, Motherpeace broke the mold. 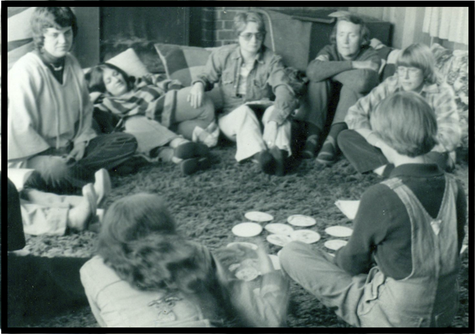 Here I am (in the overhauls on the right) sharing the unfinished Motherpeace deck with a circle of women that included Merlin Stone (on my left) and Charlene Spretnak (across the circle). Heady times! Now 40 years later, "tarot is trending." "Dior Goes Santa Cruz with 2018 Resort Line"
"Meet the Makers of Motherpeace Tarot, the Feminist Deck That Inspired Dior's Resort Collection"